Let us help you plan your next event. To speak to our sales manager please call Zella @ 872-210-0928 today! Check out our virtual tour to help you plan your event. All of our Packages listed below are based on three hours on a Friday or Saturday evening. They include the private back room or private section outside (weather permitting) if you guarantee 45 or more people. If you guarantee 25 or more people, the parties include reserve tables inside or outside (weather permitting). On weekend afternoons or Sunday through Thursday, we can provide customized events and depending on the details, parties maybe offered at lower prices. Everyone gets a free wristband and the below discounted drinks for three hours. 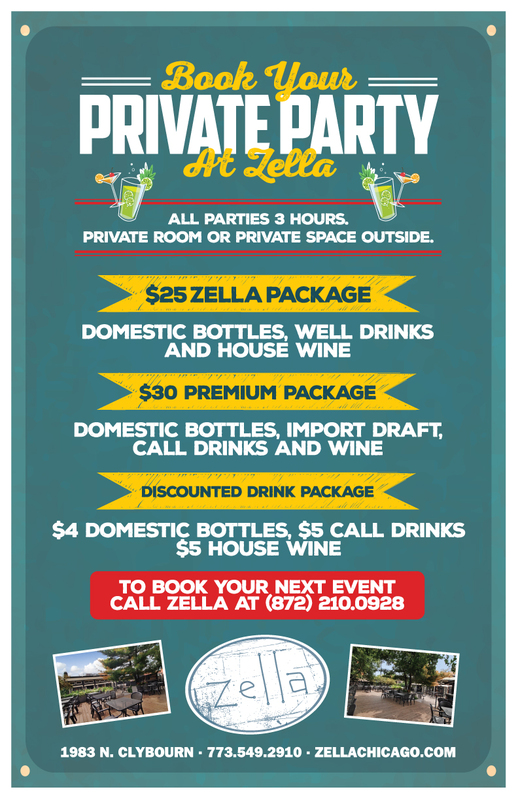 Our All-Inclusive packages at Zella are based on three hours and include the private back room, (weather permitting). On Tuesday, Wednesday and Thursday, guests can pick the three hours that they would like and parties can go on past 11pm. All persons must pay for a wristband to enter the party area. $25.00 per person on Friday and Saturday Nights. for $30.00 per person on Friday and Saturday Nights.